Wiwaxia corrugata, previously not associated with any known taxonomic group, is now thought by many to be related to mollusks. Excerpted from Improbable Destinies: Fate, Chance, and the Future of Evolution by Jonathan B. Losos, to be published on August 8, 2017 by Riverhead Books, an imprint of Penguin Publishing Group, a division of Penguin Random House LLC. Copyright © 2017 by Jonathan B. Losos. Picture a whale swimming through the ocean: streamlined body, flippers, a small fin on the back, its tail undulating up and down. Given this piscine countenance, who could fault the ancient Greeks for thinking whales were a type of fish? That view persisted for millennia until Carl Linnaeus set things straight 250 years ago, recognizing the leviathans as mammals on account of their live birth, mammary glands, and other traits. The Greeks had been tricked by convergent evolution. We’ve come a long way since pre-Linnaean scientists. We certainly know a lot more about evolution than they did, and our enhanced understanding of anatomy and the evolutionary relationships of species has identified countless cases of convergent evolution. Let me provide two recent examples. By some measures, sea snakes are among the deadliest serpents; the venom of some species, drop for drop, is as lethal as that of any ophidian. Fortunately, most sea snakes rarely bite even when handled. Not so, however, for the beaked sea snake, which defends itself fiercely and accounts globally for 90 percent of sea snake-caused human fatalities. 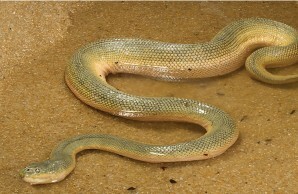 Named for the tip of its snout, which overhangs the lower jaw, the species can be very common locally and has an enormous geographic distribution, from the Gulf of Arabia to Sri Lanka, Southeast Asia, and down to Australia and New Guinea, making it one of the most widely distributed snake species in the world. Or so it was thought. In 2013, a team of Sri Lankan, Indonesian, and Australian scientists reported that they had conducted routine genetic comparisons among populations of the species and had gotten a most decidedly non-routine result. Even though the populations exhibit only minor anatomical differences across the species’ range, they were highly divergent genetically. Australian populations of the beaked sea snake were most genetically similar to other Australian sea snake species rather than to Asian populations of their own species; similarly, Asian beaked snake population allied most closely with other Asian species. As it turns out, there is not one species of beaked sea snake, but two. And the traits that define the species, not only its beak, coloration, and general appearance, but also its nasty disposition, have evolved convergently, so much so that distant relatives on opposite sides of the Indian Ocean were considered to be members of the same species. Another example is familiar to all of us. Despite my awareness of its many delivery vehicles (Pepsi, tea, energy drinks), I had never given much thought to where caffeine itself comes from. Coffee and tea come from eponymous plants; cola sodas, at least originally, came from the nut of the kola tree; chocolate from cacao; and Guaraná Antarctica (a soft drink from Brazil) from the seeds of the guarana plant. All these plants produce caffeine. And not different varieties, but the exact same molecule. In a paper published in 2014, an international team of researchers used genetic data, comparing the DNA of many plant species to build an evolutionary tree of relationships among the caffeinaceous species (focusing on coffee, tea and cacao). The team’s phylogeny showed that cacao is more closely related to maple and eucalyptus trees than it is to either tea or coffee; coffee is descended from an ancestor that also gave rise to potatoes and tomatoes, but not tea or cacao; and tea is on its own evolutionary branch, distant from all the other species in the study. We have to go way back in evolutionary time to find a common ancestor. The fact that caffeine-producing species are not closely related indicates that the ability to make caffeine most likely evolved independently in the three types of plants. Evolutionary biology is unlike many sciences in that its basic findings about the history of life cannot be derived from first principles. It is not a deductive science. You can’t go to the chalkboard and derive the formula for a platypus. Rather, it is an inductive science in which general principles emerge from the accumulation of many case studies. These piles of research allow us to distinguish what occurs regularly from what happens only rarely. Evolution occurs in many ways—just about anything plausible you can imagine has evolved somewhere at some time in some species. Given enough time, even the improbable will occur eventually. The standard wisdom is that convergent evolution happens, but is not necessarily the expectation. In recent years, however, a cadre of scientists has taken the opposite view, arguing that convergence is the expectation, that it is pervasive, and that we should not be surprised to discover that multiple species, often distantly related, have evolved the same feature to adapt to similar environmental circumstances. From this perceived ubiquity, the scientists draw a broader conclusion: evolution is deterministic, driven by natural selection to repeatedly evolve the same adaptive solutions to problems posed by the environment. In this view, the contingencies of history play a minor role, their effects erased by the predictable push of natural selection. Pikaia gracilens was the earliest known chordate, the evolutionary group containing vertebrate animals. At the forefront of this movement has been University of Cambridge paleontologist Simon Conway Morris. That he should be an evangelist for convergent evolution might at first be surprising. As a young man, he made a name for himself with his doctoral research on the bizarre animals of the fabled Burgess Shale geological formation of the Canadian Rockies. That research focused on a phenomenon that was seemingly the antithesis of convergent evolution. The Burgess Shale formed around 511 million years ago, during the Cambrian period, when animal life as we know it was just emerging. Before then, life-forms were simpler, usually more or less flat, and unfamiliar. How life transitioned from this alien world to the ancestors of today is still debated, but it happened quickly and prolifically, giving rise to the Cambrian Explosion, when most of life’s familiar kinds of animals—mollusks, echinoderms, crustaceans, vertebrates—first appeared in the fossil record in a geologically short period of time. But it wasn’t just the ancestors of today’s fauna that appeared then. When the Burgess Shale fossils were first discovered in the early twentieth century by Charles Walcott, a paleontologist who was at that time the director of the Smithsonian Institution, they were all identified as belonging to well-known taxonomic groups—mollusks, crustaceans, worms, and so on. But when Conway Morris went back to reexamine the specimens a half century later, he found that many of these Cambrian species were paleontological weirdos, with no clear affinity to any recognized taxon. 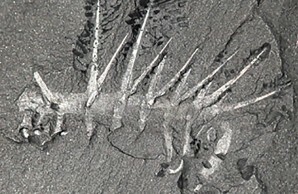 Hallucigenia sparsa appears to be related to modern-day velvet worms, an obscure, mostly tropical, group of small animals. The term “weirdo” is not standard scientific parlance, but it gives a good sense of how peculiar they are. This realization came to Conway Morris as he painstakingly examined the tens of thousands of specimens collected by Walcott and residing in the musty drawers of the Smithsonian and other museums. Consider, for example, Wiwaxia, which looks like a pinecone lying on its side, lacquered in overlapping, oval-shaped plates. Add a flat bottom, like a snail to glide along the seafloor, and two rows of tall pointy spikes running down its back, and you’ve got an animal similar to something out of a Futurama episode. These were not the only oddities—the Burgess Shale was inhabited by a veritable bestiary of the bizarre: Opabinia, whose five eyes and long, claw-tipped hose on the front of its head provoked an audience of scientists to burst into laughter when it was unveiled for the first time; Anomalocaris, various parts of which were originally described as three different species until scientists realized they were all part of the same animal; Odontogriphus, a long, flat, soft animal that resembled a floating Band-Aid with a circular mouth on the underside of the front end. The list goes on and on. 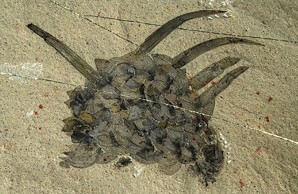 Stephen Jay Gould made the Burgess Shale oddballs famous in Wonderful Life: The Burgess Shale and the Nature of History. 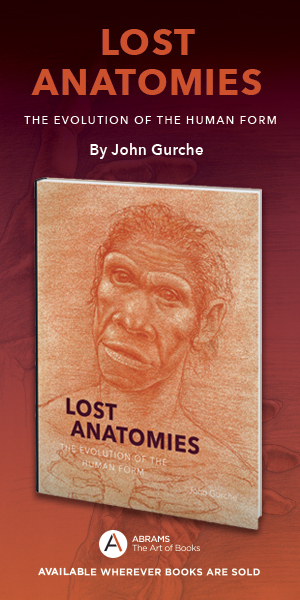 The book, published in 1989, was a detailed examination of the Burgess fossils and what they can tell us about evolution. And Wiwaxia and company weren’t the only ones Gould made famous: the primary scientific hero of the book was none other than Simon Conway Morris, who had done so much to document how the Burgess Shale fauna was populated by so many unique life-forms so unlike anything previously known. In Wonderful Life, Gould dwelled on the outlandish anatomy of the Burgess Shale’s inhabitants, arguing that the Cambrian fauna was the most diverse in Earth’s history, pointing out the many anatomical forms that appeared and subsequently disappeared, nothing like them ever to be seen again. Gould speculated about why some of those ancient beasts survived and prospered, giving rise to today’s diversity, while others perished. Were the survivors superior in some sense, destined to thrive, while the losers had evolved an inferior design? Or was it a matter of luck that some made it and others didn’t? Gould concluded that there was no reason to believe that the survivors were necessarily adaptively superior to those that perished. Rather, it was happenstance, a lottery, that led some to survive and others to perish. If life’s narrative had been a little bit different, the tape replayed in a slightly different manner, he suggested, the world likely would be populated by a very different roster today. The argument for contingency was fashioned by Gould, but his lines of evidence, even some of his major supporting arguments, were pulled straight from the pages of Conway Morris’s papers. Gould even suggested that for their accomplishments, Conway Morris and his collaborators deserved a Nobel Prize in paleontology—if only there were such a thing. But something funny happened on the way to Stockholm. Conway Morris, who had so emphasized the distinctiveness of so many of these fossils, came to see the world in a different light. Rather than dwelling on the evolutionary uniqueness of so much of its fauna, Conway Morris concluded his own book about the Burgess Shale, The Crucible of Creation, published in 1998, with a discussion of the importance and ubiquity of evolutionary convergence. 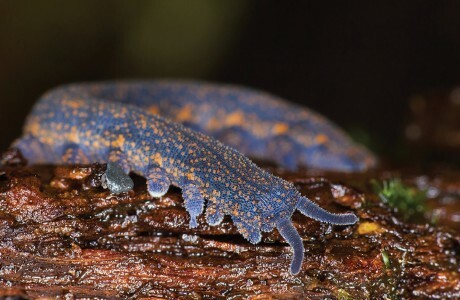 Velvet worms (Peripatoides novazealandiae) are thought to be related to Hallucigenia. At face value, this reading of the rock record seems illogical—how do you go from celebrating the diversity of idiosyncratic, never-again seen anatomies to seeing evidence for evolutionary replication everywhere? To some extent, according to Conway Morris, the explanation lies in new discoveries in the nearly three decades since Wonderful Life. Whereas a lot of the Burgess Shale species previously could not be associated with any known taxonomic group, newly unearthed fossils and detailed examinations have shown that many can now be assigned to recognized taxa. Hallucigenia, for example, appears to be related to modern-day velvet worms, an obscure, mostly tropical, group of small animals that look like a cross between a centipede and a caterpillar; Wiwaxia is now thought by many to be related to mollusks. Ubiquity is in the eye of the beholder, but it would be hard to argue that convergence isn’t common. In recent years, scientists have identified convergence in almost any type of trait you might imagine. Particularly impressive are traits that are convergent at an exquisitely detailed level, between species not at all closely related. Here’s a classic example: check out the eyeball pictured on page 19. 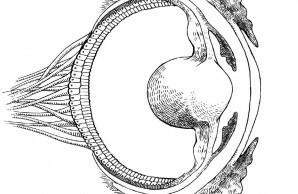 That’s a pretty typical peeper: could be a cow, or a human, or even a lizard—the eyeballs of most vertebrates are pretty similar in basic structure. But that’s no vertebrate’s orb—that one belongs to an octopus! That’s right—octopuses have eyeballs that are nearly identical to yours and mine, even though our most recent shared ancestor, which swam the Earth more than 550 million years ago, had no eyes to speak of. Convergent evolution isn’t limited to anatomy. Species can converge in any attribute of their biology, from genes to behavior. For example, ants and termites aren’t closely related. Ants’ nearest kin are wasps and bees; termites belong to—of all things—the cockroach family. Despite their phylogenetic distance, the social structure of ants and termites is remarkably similar. Both live in colonies numbering dozens to millions; one or a few females do all the egg laying; and a variety of worker types perform the main tasks necessary for colony maintenance. And both use liquid food passed from one individual to another to regulate the type of worker a developing female becomes. 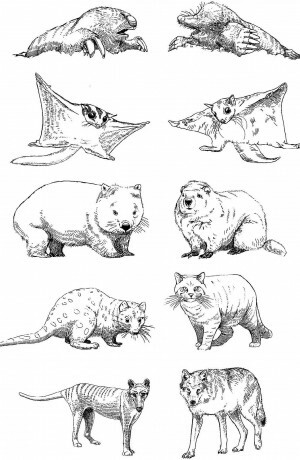 Evolutionary copycats occur throughout the natural world. New World and Old World vultures are convergently ugly in their shared mortician’s countenance. Australia’s death adder is a member of the cobra family, but in appearance—and venom composition—it is a close match to the distantly related puff adder, a member of the viper family from Africa. 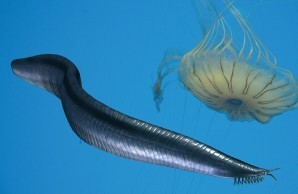 Eel-like bodies have evolved not only in many types of fish, but also multiple times in aquatic amphibians and reptiles. Dry areas of Africa are covered with tough-skinned plants with sharp spines and no leaves, but they’re euphorbs (members of the Euphorbiaceae), rather than the cacti of the New World. 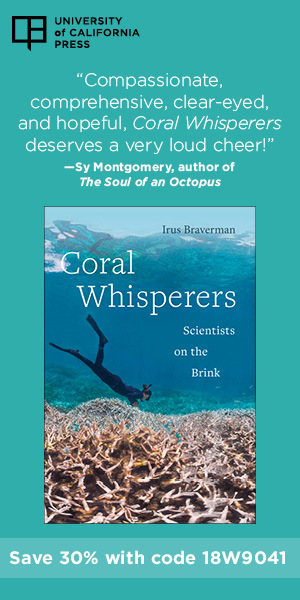 Conway Morris and his colleagues have made long lists of examples of convergence, but it would be just as easy to make comparable catalogs of species without counterparts. Consider the kangaroo. Kangaroos are the major native plant eaters in Australia today. Functionally, they fill the same role as deer, bison, and myriad other herbivores in the rest of the world. And yet, kangaroos haven’t converged upon these other types of herbivores. And then there’s the koala, that lovable, bearish tree hugger that lives life in the slow lane, sleeping twenty hours a day as it detoxifies the eucalyptus leaves that comprise its diet (and that make its fur reek of menthol). Nothing like it exists anywhere else in the world, now or, according to the fossil record, ever. But when we’re talking evolutionary one-offs, there’s only one king. Venomous ankle spurs, luxurious pelt, the ability to detect the electrical discharges of their prey’s muscles with electroreceptors on their snout. Powerful flat tail, webbed feet, lays eggs. Bill like a duck. The world’s greatest animal, the duck-billed platypus, a mishmash of parts borrowed from throughout the animal kingdom. An animal so confused that when the first specimens arrived in England at the end of the eighteenth century, shipped from Sydney across the Indian Ocean, scientists searched for hours in vain to locate the stitches by which crafty Chinese merchants must have assembled their hoax. These examples have come from Down Under, but evolutionary one-offs occur everywhere. Giraffes, elephants, penguins, chameleons—these are all species exquisitely adapted to their specific ecological niches, with no evolutionary facsimile now or in the past (note that an “evolutionary one-off” is not necessarily a single species. For example, all elephant species are descended from a single ancestral elephant—the proboscidean way of life only evolved a single time). 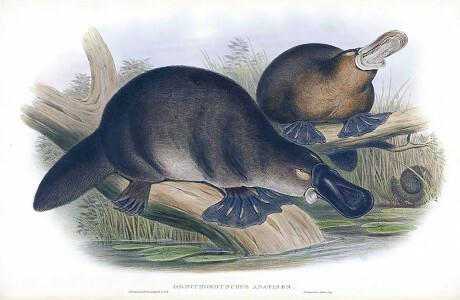 Illustration of a platypus, Ornithorhynchus anatinus, an evolutionary one-off. So, where does that leave us? Is convergence pervasive, a demonstration of inherent structure in the biological world, channeled by predictable forces of natural selection toward outcomes predestined by the environment? Or are examples of convergent evolution the exceptions, cherry-picked illustrations of biological predictability in a haphazard world in which most species have no evolutionary parallels? We could argue these points back and forth until we’re blue in the face. I’d throw out the platypus, you’d counter with convergent hedgehogs; I’d postulate the unique, algae-encrusted, upside-down-hanging tree sloth, you’d retort with bipedal-hopping mice independently evolved on three continents. And that is how, essentially, this controversy has been debated historically, by compiling lists and telling stories. Conway Morris and his colleagues are to be commended for bringing convergent evolution to the forefront. We all knew about convergence as a neat trick of natural history, a striking example of the power of natural selection. But Conway Morris and company have made clear that evolutionary duplication is much, much more common than we realized. We now recognize that it’s a frequent occurrence in the natural world, with examples all around us. Still, it’s far from ubiquitous. Seemingly just as often, maybe more often, species living in similar environments don’t adapt convergently. At this point, we need to go beyond documenting the historical pattern, chronicling yet more examples pro and con. Rather, we need to ask whether we can understand why convergence occurs in some cases and not others—what explains the extent to which convergence does or doesn’t occur, why bipedal-hopping rodents have evolved independently in deserts around the world, but the kangaroo has only evolved once. And to do that, we need to do more than add additional examples to our lists. We need to test the evolutionary determinism hypothesis directly.